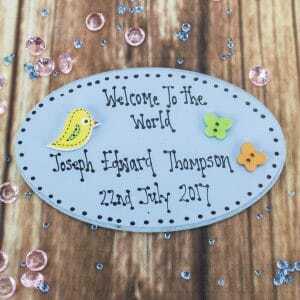 Treat a newborn boy to our delightful personalised blue wooden plaque that has been specifically designed to commemorate those important details from the moment they entered this world! Gift a newborn baby girl our chic personalised wooden plaque a unique touch to commemorate their day of birth that's perfect to hand on the wall of their nursery or of their bookshelf! This stylish wooden heart, is the perfect gift for every baby boys nursery wall to remind the world of how cute they are and that also allows for personalisation for that extra special touch! Treat a newborn girl with our uniquely designed pink wooden plaque that is the perfect keepsake to commemorate those important details from the moment they entered this world and to remind them of how loved they are everyday!